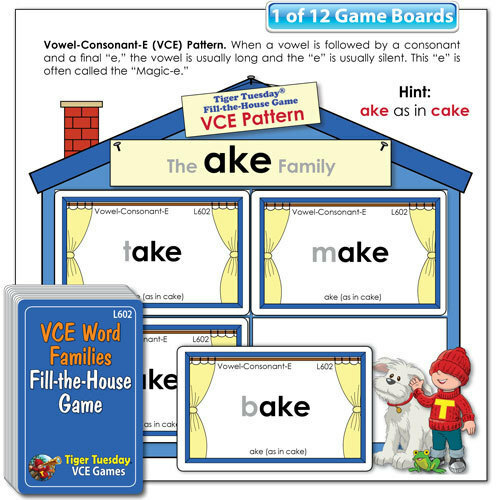 Kids learn long vowel sounds and VCE words by "filling the house"! Similar to "bingo" and "lotto," playing the VCE Fill-the-House Game gives kids lots of fun practice in decoding words conforming the VCE pattern. In no time at all, kids naturally learn the basic phonemic pattern. Examples of VCE families ("house" boards) include: the "ane" family, the "ice" family, the "one" family, the "ose" family, "ake" family, and the "ave" family.